The newly constructed section of highway E4 trough Sundsvall is a major project with a price tag of roughly SEK 4.6 billion. The construction work began in spring 2011 and was completed in 2014. Nynas Endura F2 is a highly modified premium binder with tremendous flexibility and resistance to deformation, as well as good properties at low temperatures. Long lasting asphalt is not only cost-effective but also has less environmental impact thanks to better wearing resistance. Those are the reasons behind the choice of wearing course for the Sundsvall Bridge located in the north of Sweden. 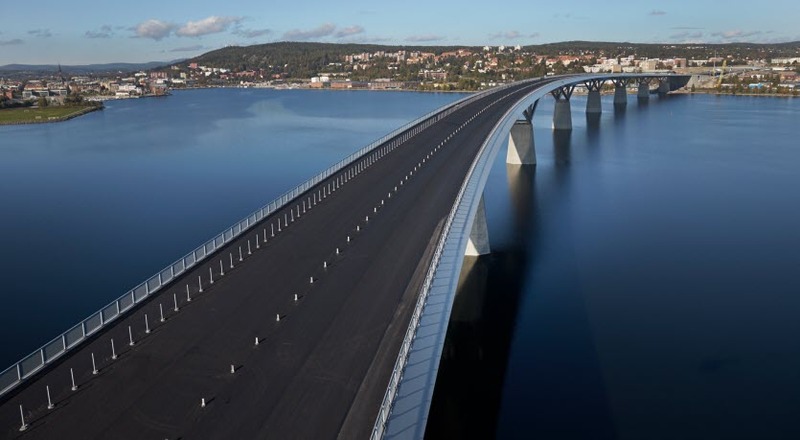 The most eye-catching part of the project is the bridge over the Sundsvall river, which with its length of 2 109 m was the largest bridge in construction in Europe at the time. In the middle of September 2013 Skanska took over the bridge to add a 40 mm thick wearing course. This late in the season temperature drops quickly as the cold winds gush on the steel bridge. When carrying out normal asphalt work, some of the heat is always left in the body of the road. This is something the paving crew could not benefit from on this project. "We had a huge amount of luck with the weather 18 °C and almost no wind at all. That made our work a lot easier, since the Nynas Endura F2 and the binder is relatively thick due to its high polymer content and the mix can become difficult to compact if it cools down way too much" says Fredrik Wikberg, production managerat Skanska. Nynas Endura F2 has been used on large bridges before, including the Öresund Bridge between Denmark and Sweden. It is the best possible surfacing option available, according to Fredrik Wikberg. "We chose the same concept for the Högakusten Bridge in 2012. This type of highly modified bitumen is very elastic, almost like a rubber band. This is necessary because a bridge always has some movement. With a conventional asphalt-mix there is an increased risk of cracking and stone loss from the surface." A total of 10 000 tonnes of asphalt was produced just a few miles away from the bridge where Skanska has their plant. The combination of a polymer-modified binder with good rock ensures that the surface is wearing resistant yet flexible. This is important because of the traffic intensity on the bridge with high proportion of vehicles with studded tires and the use of salt in the winter. When the Swedish Transport Administration decided to re-surface the Högakusten Bridge in 2012 to pre-empt any future cracking or stone loss, the original surface layer was still in surprisingly good condition, despite the fact that it has been there since 1997. The binder used at that time was of the same type as Nynas Endura F2. The pavement consists of 25 mm mastic asphalt with a 40 mm wearing course on top. The mastic asphalt acts both as a binding layer with the protective seal and as a solid foundation for the wearing course. This is necessary since the thickness of the pavement must be kept to a minimum to reduce the load on the bridge. In total more than 2 000 tonnes of mastic asphalt was used. A polymer modified binder (Nypol) was chosen for extra stability. These types of polymer modified mixes are very elastic – a crucial property to make them able to withstand the movements of the bridge. Other mixes may crack and lose rocks from the surface. This is abrasive to the paint on the cables and beams eventually resulting in expensive rust damage. Before the surface work could start, a sealing layer was put in place to protect the steelwork against moisture and salt and thus prevent corrosion. The sealing layer includes a primer (thermosetting plastic) and an insulating sheet containing polymer-modified bitumen (PMB). This initial work was carried out under the protection of two 100-metre-long tents that were erected on the bridge. "Because of the more time consuming production of mastic asphalt, the paving work will take longer time than with conventional asphalt. In spite of this drawback, we managed to place an average of more than 180 tonnes per day." says Mikael Kinnmark at DAB, who had coordinating authority for the contract, from the sealing layer to the finished pavement. The job was divided so that DAB produced and placed the sealing course and mastic asphalt while Skanska did the wearing course. "We had a tight timetable, which meant working seven days a week on a very strict schedule. One upside was that we could produce the mastic asphalt at Skanska's plant in Sundsvall, which cut our transport route". The smooth cooperation between DAB and Skanska was a key success factor in view of the tough requirements on the project. "That went for everything, from material sampling and testing in the laboratory to validating an even and smooth surface. We carried out three samples per 500 square metres and about 700 adhesion tests to ensure the best possible quality," says Mikael Kinnmark in conclusion.